I've had my eyes on Yaiba: Ninja Gaiden Z ever since I heard about the game late last year. Judging from the pics and overall style of the game, it looked quite good. Yaiba is a third person action game that is a side story of the Ninja Gaiden franchise. The game is developed by Team Ninja, Spark Unlimited and Comcept. The producer of the art style of the game is Keiji Inafune, well-known for his Mega Man series while working with Capcom. With this kind of development staff heading the production of the game, I thought I would absolutely love Yaiba. Boy, was I ever wrong though. Yaiba certainly shows me not to trust a development staff and the overall look of a game for the future. Yaiba Kamikaze is a ninja who was once part of a clan that chose their own clan members to fight against the strongest of their clan (Yaiba) to test each ninja's ability. Yaiba got sick of battling weaklings so he slaughtered his whole clan. Eventually, he meets Ryu Hayabusa and battles him then Ryu greatly injures his left eye and cuts of Yaiba's left arm. Yaiba is on the brink of death, but is discovered by an organization that repairs his injured body parts with cybernetics that enhances his abilities. A zombie outbreak occurs and the organization sends Yaiba to put an end to the outbreak - Yaiba will try to hunt down Ryu Hayabusa as well, since Ryu is also involved in trying to stop the zombie outbreak. The setup for Yaiba and the overall story and character design is great. The game has a cell-shaded appearance and the overall graphics are pleasing to the eyes. The animation is fluid for the most part and the characters are all well represented. Monday is a female character that constantly keeps in touch with Yaiba through radio and she has some very funny lines at times. Some of the dialogue in Yaiba is completely wasted with cheap moments of cussing and overall bad jokes, but it can be funny at times. The overall appearance and the characters are easily the best part of the game. The combat is decent but I often found it lazy. Yaiba can attack with his sword, cybernetic arm and flail - all of these are mapped to a button. Yaiba has all kinds of combinations that can be used while switching between each type of weapon. Yaiba gains skill points that allow him to upgrade his abilities to gain new attack combinations and enhancements from the skill upgrade screen. His health can be upgraded by collecting health artifacts and there are a few other types of collectibles to find throughout the course of the game as well. 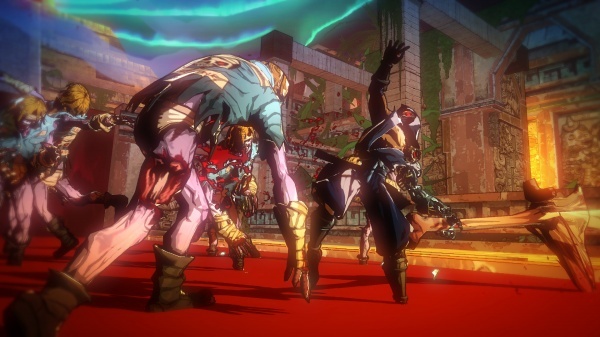 For enemies, Yaiba will often fight a type of zombie. The game has a whole variety of different types of zombies. Normal zombies are your basic little playthings that often arrive in immense groups. Yaiba can work up a huge combo on normal zombies and then finish them off once they are weakened through a finisher button. Yaiba can only finish a zombie when it has an exclamation point above its head toward the end of a combo, so you have to be fast to press the finisher button at that time. By upgrading his skills, Yaiba can execute several zombies in a row if you tap the finisher button at the end of a finishing move. The violence is very pleasing overall, but sometimes it's hard to tell what Yaiba is actually doing because of the camera. The camera is one of the real downfalls of Yaiba when it comes to combat and it can also be bad while Yaiba moves around an environment when not fighting. The camera will stay fixed in one angle and follow Yaiba as he moves from left to right in the background. The problem with this sort of camera is that it allows Yaiba to get VERY far away from the camera and it often becomes hard to find him. Yaiba will literally blend in with a screen full of zombies and it becomes hard to distinguish him from the crowd. Sometimes an object will block the camera view when it follows Yaiba as well. To add to the camera frustration, the mini-boss type enemies in Yaiba can be incredibly annoying. The standard zombie will stagger when hit, but a good bit of the bigger enemies will not stagger unless Yaiba performs his cybernetic punch, and even then, Yaiba still runs the risk of getting hit very often. Some enemies have very little staggering at all. Enemies give off very little warning when they are about to attack and sometimes their attacks are unblockable. You just have to learn which attacks are unblockable and which are not since there are no markers to tell you. I found myself often running in fear of enemies because of their great amount of attacks that come at the blink of an eye and the fact that I couldn't stagger them for long at all. Sometimes, normal stagger hits wouldn't work against enemies when they used to a few second ago - it's like some sort of hidden invincibility frame that was would happen very often. I began to feel that I could never get the upper hand on some enemy types no matter how hard I tried. Yaiba is the first game in a very long time that I have had to turn down from normal difficulty to easy difficulty in order to complete the game and, even on easy I would still die at times from certain enemy types. The difficulty in the later stages becomes overly ridiculous at times. The bosses are not often the hard part. The bigger enemies that you'll find in the mix of zombies are often the hardest and cheapest. Enemies in Yaiba drop health pickups if Yaiba finishes them off with a finisher once they are beaten but when you have a bigger enemy that follows Yaiba throughout an area and won't allow Yaiba to attack other enemies, it becomes such a struggle to regain health. In normal mode, the enemies take quite a chunk of Yaiba's health per hit (at least 25% most of the time) and bosses can literally trap and kill Yaiba with their multi-hit attacks. Yaiba has checkpoints, but they are not spread out well enough at times. Sometimes, if I died, I would have to repeat several waves of cheap enemies to get back to the part that I was at. The game has elemental enemies and elemental enemy appendages that can be torn from enemies and used as a weapon. Yaiba can get a bile appendage from an enemy then use that to set fire enemies on fire by spraying them with bile. He can rip the head from a flame enemy and shoot a bile enemy with it to set them on fire through their flammable bile on their body. 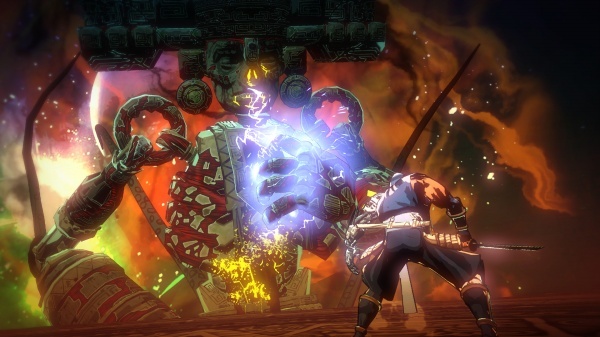 The elemental feature in Yaiba is used in puzzles throughout the game. Yaiba has both puzzle areas and platforming areas spread throughout the waves of enemies. Puzzles without elemental properties often involved grabbing a zombie and throwing it into some sort of object. Yaiba also has a rage meter that he can build up through executing enemies. Once it is full, you can press in on both analogs to make Yaiba do double damage and not take any damage from enemy hits for a certain amount of time. One problem with the rage meter is that it cannot fill up at all during tough enemy battles if Yaiba can't kill an enemy - so if you have two incredibly annoying mid-boss enemies on the screen and a rage meter that is ALMOST filled, you can't fill it. Yaiba has very few "true" boss battles. The majority of the boss battles are often enemies that Yaiba will run across once again in later levels when they appear as normal enemies. There is one point where Yaiba will have to fight Ryu Hayabusa and there is an exclusive end boss. The actual boss battles often involve Yaiba taking advantage of the elemental system in order to damage or stun a boss so they can be attacked. Once I had completed Yaiba, I simply wanted to set it aside out of frustration in the overall difficulty and especially the cheap combat. The game has a unique arcade mode once the game has been beaten, but other than that, you can just replay through the story on another difficulty and find collectibles that were missed. Yaiba has an Easy, Normal, Hard, Nightmare and Hell difficulty so it has quite a few difficulties to challenge a player. 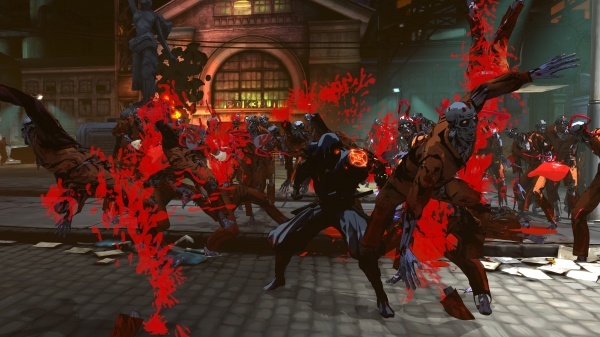 Yaiba: Ninja Gaiden Z might be able to find an audience through players that are extremely hungry for an action game or those that are compelled to have everything related to Ninja Gaiden, but I really see the game as a missed opportunity. I wanted to like Yaiba based on its art style and overall look but the game is filled with downfalls and most of them are from the game's combat system. I must admit that I did have fun with the game at times, but there was always something there to remind me of how bad the game truly was in some way. Fun was all too often interrupted by frustration from cheap enemies or the camera. Yaiba is far from a good value for a $60 game. If you're even slightly interested, be sure to wait for a price drop or rent it because the game is such a lazy mess and only a shell of what it could have been. It's really such a shame to see such a cool art style go to waste like this. Final Rating: 50%. Yaiba looks really cool from screenshots, but the combat system is very cheap and makes the game more frustrating than fun.